Dr. Ben Carson speaking at a special presentation for his potential candidacy at Grand Canyon University in Phoenix, Ariz., on Jan. 29, 2015. Picking the most controversial Ben Carson quotes is no easy task. Like popular GOP rival Donald Trump, Carson refuses to bend to "political correctness." "Jesus will KILL everybody who does not worship on Saturday" is his worst belief and nobody will cover thatd. What this article means is that the author is bending to political correctness which is killing this nation, in short the author is a follower. He or she follows the direction of the wind and not what is the right thing to do. Being a leader means saying the things that people dont want to hear, like Martin Luther King Jr. but saying them anyway sometimes costs you ridicule or your life. Thank God for leaders like King and Carson, who say things that some people don't like, setting an example to all who thirst for true leadership and not weak minded writers of articles that people that continue to beat the drum of ignorance. Orson Wells saw right: 1984 and citizen Kane. And Nostradamus claims we will be fighting against a China-Russia-Arab coalition. We're heading that way, after what Russia and China claimed about knowing more precisely about the world problems than the U.S. And it's no secret for anyone anymore that governments all around the world will take away paper currencies for electronic transfer payments. Mr. Carson says things in a different way, but all I understand is that he talks without filtering his thoughts. You may think what I bring forward makes no sense, but just about anybody can say anything, but it only reflects how they conceive events. @Russell Earl Kelly. Wow as if you saying it makes it true – especially with the captions ROFL… talk about a complete twist and lack of context – Carson did Not say that. Thanks for joining the throng of 'disinformation bloggers'. Your contribution is less than helpful at such a time for America and not in the least convincing… maybe next time huh?… good luck with that. I see "controversial" quotes from Carson & Trump…. I guess Clinton has never said anything "controversial" since she is not listed. Makes me wonder just how independent this newsletter really is. Dr. Carson is correct in all his "controversial" statements. The Obama Administration and liberal ideology have seriously subverted our country. 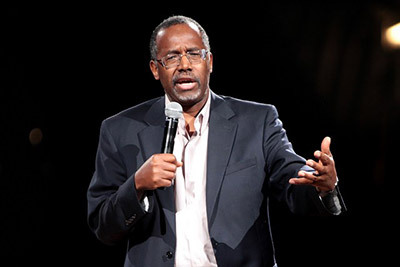 I hope Dr. Carson will win the election and surgically remove that cancer from our land.